Taster Pot For Red, Orange & Yellow Paintwork. 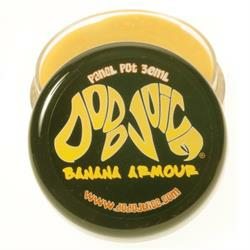 If you wanted to try a Dodo Juice wax before diving into a full sized tub, then the Mini Jar is the perfect introduction. Banana Armour is a carnauba-based hard wax, colour-charged to best suit warm coloured paintwork. Perfect for layering, Banana Armour spreads thinly before setting very hard to provide fantastic shine, water beading and durability. This formulation is specifically made to bring an extra special warm glow to red, orange and yellow paintwork. Size: 30ml - enough for around 4 coats on the average size vehicle.